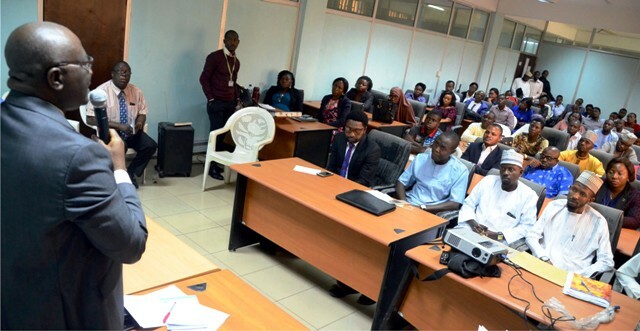 Managing Director, News Agency of Nigeria (NAN), Mr Bayo Onanuga (left), addressing new employees of the agency, during an induction programme at NAN’s headquarters in Abuja, last Monday. The Central Bank of Nigeria (CBN) has re-strategised to meet the financial inclusion target set for 2020. The apex bank in its plans to meet the 80 per cent financial inclusion target for all Nigerian adults has set up a “Financial Inclusion Secretariat,” to coordinate the implementation of the strategy. CBN has also inaugurated a financial inclusion state steering committee in Abuja, aimed at boosting the achievement of 80 per cent inclusion. According to CBN release, new target has been given to Deposit Money Banks (DMB) and Micro Finance Banks. According to the statistics, the apex bank launched the “National Financial Inclusion Strategy in collaboration with stakeholders on October 23rd 2012. The strategy was aimed at reducing financial exclusion rate to 20 per cent in 2020, which would also reduce the level of poverty. However, despite the moves from the apex bank, the latest data of inclusion shows that in 2016, only 58.4 per cent of adult Nigerians were financially included as against 60.5 per cent visible in 2014. In 2017, (three years to 2020), survey shows that Nigeria is currently battling 41.6 per cent exclusion rate, which CBN says required double effort to achieve the 80 per cent goal in 2020. It would be recalled that the Branch Controller CBN, Abuja, Elizabeth Agu, who inaugurated the steering inclusion rate of the current financial inclusion rate of 41.6 per cent was still low compared to the target of 80 per cent come 2020. Agu stated the need for hard work on the exclusion rate from now to 2020, adding that CBN had set a target for banks in the FCT to open 1,500 new saving accounts for customers, while Micro Finance banks would work hard to open 2,500 new accounts for customers.